Shopbop is having another amazing sale!! 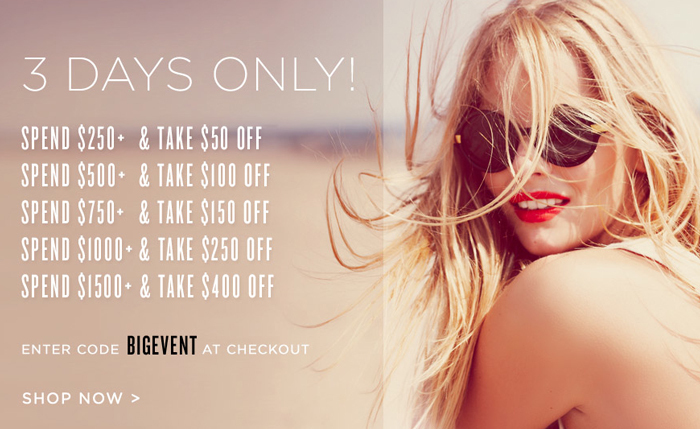 With any purchase over $250, you’ll get at least 20% off! Just enter code BIGEVENT at checkout. Click here to shop now or see below for my top picks! LEFT: The eyelet fabric and rounded hem on this Pencey dress make this the perfect summer shift. Dress it up with a colorful statement necklace and colorful sandals! CENTER: Seeing as I’m a huge leather lover, I’ve been drooling over these Helmut Lang leather pants in both gray and black. Leather is going to be major again this fall, so stock up while great pieces like this last! RIGHT: What’s not to love about this Zinke one-piece? Sorbet shades, geometric print AND a peplum waist? Consider it purchased.